A week ago today, Yoda and I set forth on a new journey to Dallas, Texas. We packed up our belongings… Wait. Let me rephrase that. We packed up most of our belongings – enough to get the apartment in Dallas stocked and ready for Darling to live. The movers came, loaded everything we had ready to go and we travelled the 350+ miles to our new city. The next morning (Thursday) we frantically took possession of the keys to our new place. At that time, quasi-misery sunk in. I feeling heartsick and anxious because we were signing paperwork mere minutes before the moving van was to arrive AND I was, at that time, showing the first symptoms of influenza. Within a couple of hours, the moving van had departed and we were already unpacking boxes. Now… I think it really needs to be noted that when someone is moving into a new place there is a specific item that cannot be forgotten and needs to be unpacked first. I can honestly say I went out to eat lunch primarily because I needed to use the facilities more than I needed sustinance. My word how I just wanted to pee. It felt like releasing Hoover Dam on the Colorado River. My bladder stood and applauded. Then I had to go and drink like two or three glasses of tea thereby doing a “lather, rinse and repeat” type of moment. Just for the record, La Hacineda on Highway 121 has a nice ladies restroom. While we were there for the initial move, I wasn’t in much of a condition to drive. I didn’t even care if I drove. In hindsight this may be a problem. I’m pretty sure I’m going to get lost at some point, but thankfully I have a GPS and GoogleMaps. I figure when the time comes, I’ll just blow through a tank or two of gas learning the area and figure it out from there. I bring this up because we had to go shopping and Yoda needed to learn his way around. Not only did we need the aforementioned toilet paper, but we also needed food, as we didn’t bring much from the house. We also needed silly things that people take for granted such as shower curtains and that type of thing. However, I think as Darling was learning his way around, we drove down the same street like 50 times. At this moment, I can’t even remember the NAME of the stupid street. For the next couple of days we unpacked pretty much the entire apartment and as we did, the flu got worse. Yoda, the tape-dispensing Jedi Master, is also a master of the box-cutter. (Though I’m not too shabby with the blade.) 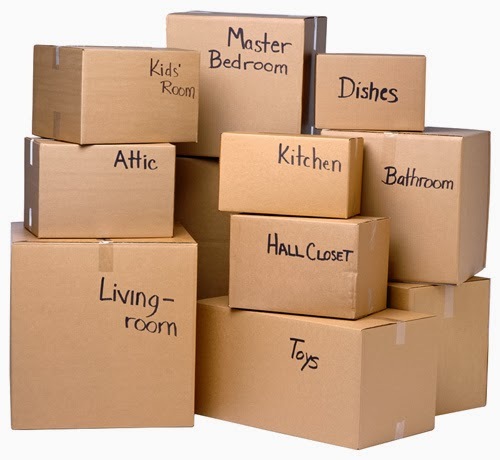 He tore down almost every last box he’d so painstakingly put together, just so we could bring them back home and load up some more stuff – “my” stuff to be exact. I’m really hoping to find a job soon and be back with Yoda before I know it. We were supposed to come back Saturday, but I felt so miserable we came back Sunday. I don’t know that made any difference other than I got some more sleep. But Yoda Darling was a good sport and drove the entire way while I was doped up on Nyquil. As an aside: We also had kicked in the two month trial on SiriusXM satellite radio. It made more a much more enjoyable trip down and back. I’m STILL going through all the channels and have yet to find my favorites, but it’s really nice to have options. This will make the commute times in Dallas so much easier. What channels do you listen to? Why? Anywhoo… just catching up on a few things. I’ll see you on the flip side.